Review by AllTheBestFights.com: 2018-10-06, nice and tough exchanges from the first bell: Luis Nery vs Jason Canoy gets three stars. The undefeated former Wbc Bw champion Luis Nery entered this fight with a perfect record of 26-0-0 (20 KOs=77%) and he is ranked as the No.1 super bantamweight in the world. In his last three bouts he has defeated twice Shinsuke Yamanaka (Yamanaka vs Nery I and Luis Nery vs Shinsuke Yamanaka II) and, between the two fights with the Japanese, he beat Arthur Villanueva (Luis Nery vs Arthur Villanueva). His opponent, Jason Canoy, has an official boxing record of 27-8-2 (19 knockouts) and he entered as the No.39 bantamweight but he lost two out of his last three fights, against Mzuvukile Magwaca and Hiroaki Teshigawara, between these two bouts he defeated Renerio Arizala. 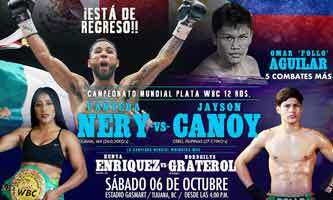 Nery vs Canoy is valid for the vacant WBC Silver bantamweight title. Watch the video and rate this fight!